A “Class of 1973” inductee, the final induction class into the Reds Hall, Ed was the team’s most prolific goal scorer in the late 1960s, netting 152 goals and 102 assists over seven campaigns with the Reds. While his average of over 27 goals per year and his crewcut, bulldog style made him both a team and fan favorite in Providence, the height of his professional career was reached during his two seasons in a Chicago Blackhawks uniform prior to joining the Reds. In the 1967-68 season with Providence, the right winger teamed with player-coach and center Dave Creighto, and young left winger Brian Perr, to catapult the Reds into the AHL playoffs after a four-year absence. Kachur netted 47 goals that magical season, the most of any player in professional hockey that year on the AHL’s most dangerous and productive line. 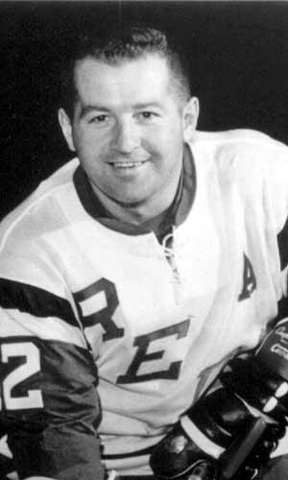 Ed ended his professional career as player-coach of the Johnstown Jets of the Eastern Hockey League, one of seven leagues he played in over his great career. In 1998, he was also inducted into the Northeastern Ontario Sports Hall of Fame.